It's that time of the year again when all the ghosts, skeletons, and pumpkins come back to the Spiral! Spooky Bob, Jack O' Lantern, and the whole gang are back to bring you a scary good time this Halloween season. What's new this year? What's being brought back? Keep reading for all the spooktacular information! Remember that header? That was from last year's Halloween. That was the year all the new pets were added. The Black Cat is back as usual along with the Zombie Piggle, Nightmare, and Ghost Dragon. I love Halloween. It is just an amazing time of year when all Wizards can dress up however they want and look unique. Pumpkin hats, skeletal bodies, and much more! 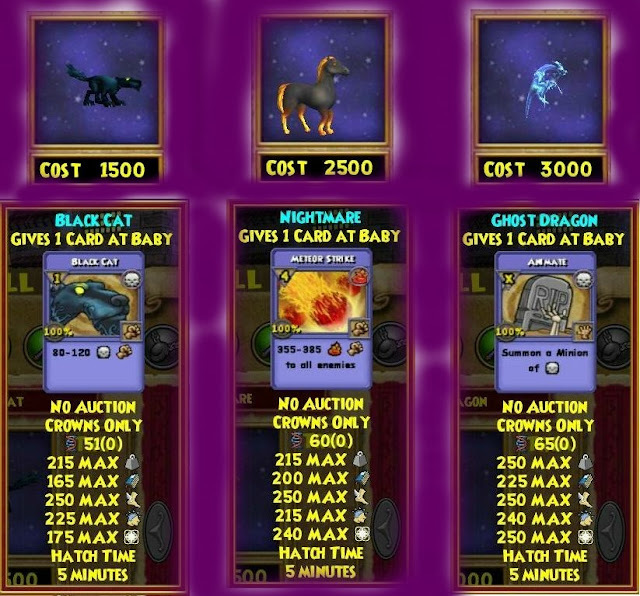 Overall, I have spent a few thousand crowns on Halloween gear. I love the unique packs that come out, the outstanding pets, and the miraculous gear. In addition to that, the Halloween Castles are back in Ravenwood where everyone can do the dungeon and get exclusive prizes. 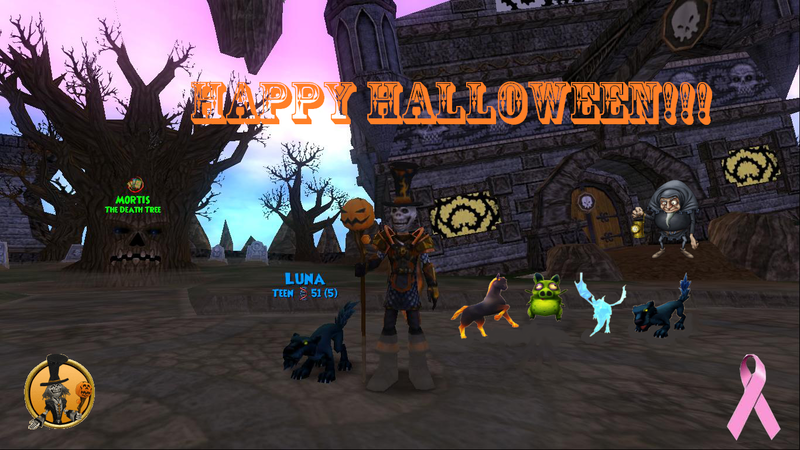 Not to mention Jack O' Lantern is back with his variety of quests sending you throughout Wizard City to locate ghosts, pumpkins, and talk to other NPC's. 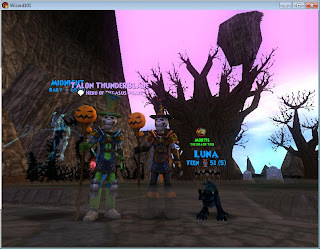 This year, Kingsisle added 3 new packs to Wizard101 for the Halloween season. The Spider, Graveyard, and Decorating Packs each contain special and unique items. I recently wrote a post about it which you can find here. Nice. ^^/ I'm going as the Cheshire Cat. Sweet! I love the header from last year. If I recal, the breast cancer symbol is for breast cancer awareness month? Yea, it was meant for breast cancer awareness month. October 1st-31st we show support for breast cancer. I specifically do because people in my family have been affected by breast cancer and it impacted my life.